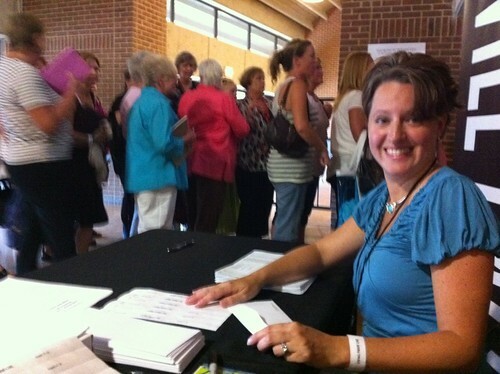 This past weekend I had the great opportunity to serve with a group of my church ladies at the Beth Moore conference here in Richmond Virginia. 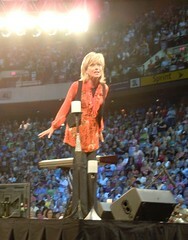 Now I should mention and for you guys that know me you already know this I am a HUGE Beth Moore fan! I love her teaching and I consider her a huge mentor in my life. So to be able to serve her ministry and to hear her teaching first hand was just wonderful. I had no idea what God had in store but in the weeks leading up to this event I could tell by a few things that were going on that He was up to something. He always is isn’t He! So for this weekend I decided that bringing my wheelchair just was going to make things to difficult so I would bring my crutches and just deal with the pain. The fun part though is I can decorate my crutches up a bit 🙂 This is Beth Moore after all! I think she would have loved my color coordinated my scarfs with my outfits for my crutches. The fist day was turquoise and the second day was pink. Our coordinators for our trip Vangie and Pam are so awesome. Vangie drove the church fan and even brought us waters and snacks and Pam well she worked out all the details and kept us in prayer and updated about all the details leading up to the event these ladies rock. Here is our fearless van driver Vangie driving the church van. 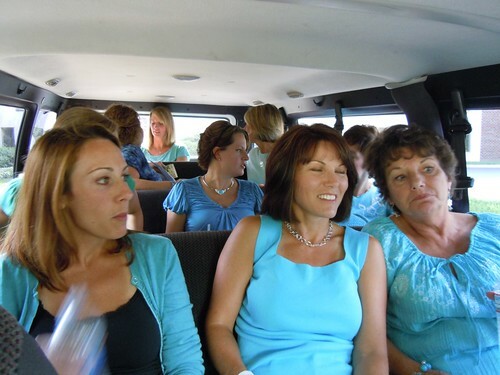 I was sitting in the front seat so it was so neat looking back and seeing the sea of turquoise ladies excitedly chatting away. When we got there we were divided into our groups. Now because of my physical situation I had called a few months before the conference and asked my friend Tina if I could stay with her that Friday night because of how early we had to be at the church on Saturday. She was so amazing. Not only did she give me a place to stay but she also shadowed me the entire weekend carrying my stuff making sure there was a clear path for me to get to my seat. What an amazing friend she was to me. I’m so appreciative. 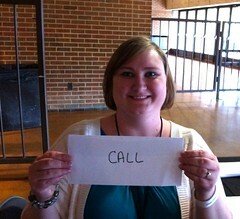 So we got assigned together to will call. Now little did I know we both had wanted to be greeters but we got assigned to will call because I needed a chair and we got the will call that was at the main gate. We were both so nervous. She was so funny she said,”You owe me not only do I have to count money but I also have to do my ABC’s.” We laughed a lot and handled it so well. It was so awesome to see the how God worked. Tina had a lady come in and her group had an extra ticket so they said they wanted to donate it. Right after that group donated their ticket another lady came in right behind her. Now I should mention these ladies had been standing in the hot hot sun for about an hour or two to get in to the conference. She cam in and she was a bit panicked looking. She got her wallet out and she said she wanted to buy a ticket but she wasn’t sure if she had enough money. She was outside literally counting out her dollars. 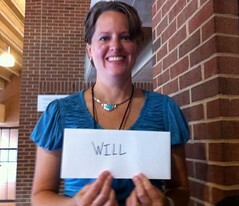 I wish I had a picture of the look on her face when we gave her that donated ticket. My eyes are filling with tears as I see it in my mind now. God knew that woman needed that ticket! Situations like this happened over and over again. Me and Tina were so touched to see Him working. 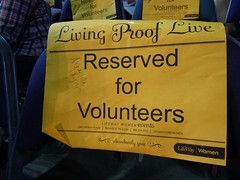 A ticket would be donated and then the person that God had it there for would come right in. The last two tickets we gave out were to a mother and daughter and their faces just lit up and they shouted with joy. Here are a few pictures of me and Tina working Will Call. So this is the part of the story where I was talking about God has different things in store than what we imagine. 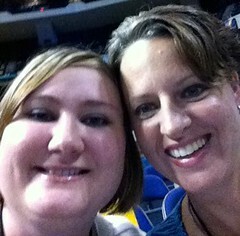 I came to Beth Moore all excited about seeing Beth. Yes I was excited about the message couldn’t wait for the teaching but I had no idea that He would touch me even more through the serving part. Volunteering for this event touched my heart more than you can imagine. It’s not very often these days that I get to serve and wow I just loved seeing the looks on these women’s faces as they entered the main gates. The excitement, the waiting, the intensity of wanting a change and needing a revival in their hearts and their lives. Its so easy as I have stated in previous blogs that when we are going through our own battle and our own situation to forget everyone of us is going through something. We all have a battle we all have a situation that we’re forging through. I loved serving these ladies. 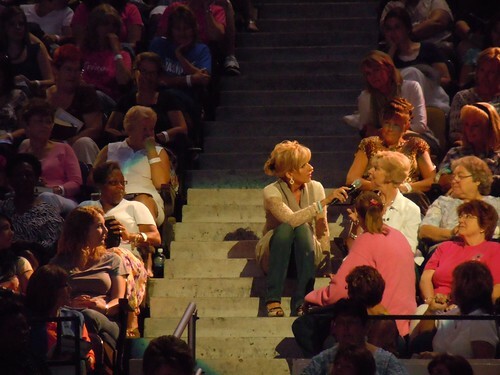 I especially got to see this and I pretty much fell apart when I did on day 2 when Beth had a special altar time for ladies to come down and get prayed for. I was on the front row by the stage. So I could see their faces waiting in line. 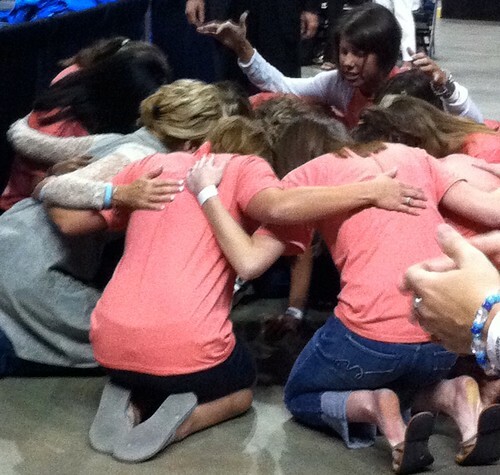 Some of them barely made it to the prayer partner before their knees hit the floor crying their hearts out to God. Again can barely type through my tears as I remember this. So powerful. There were 9,300 women there all being touched at the same time! God is so awesome isn’t He! Whew okay collecting myself. Here are the few pictures I managed to snap of Beth. This another thing God did to my heart to while I was there. I really wanted a great picture of Beth on stage and I just couldn’t snap one. The lights where I was at where interfering. Well God just stopped me in my tracks and said, “Amanda, are you here to see Beth or get a message from me?” So I stopped taking pictures and started taking tons of notes! In going through my photos I realized God gave me my one photo! So this was pretty amazing. On day 1 of the event Beth read a couple letter she had received from a lady that she said she had been praying for whose young daughter had been battling leukemia and was just about to have her last chemo treatment. She asked if the lady was there but couldn’t find her in the crowd. So on day 2 Beth was in the crowd just asking some questions about what people thought about the night before and this photo below is of her doing this. Well right after this photo she went up a few rows to ask another lady a question and guess who it was!!! It was the lady and her daughter!!! They hugged they cried we cried. I was crying too hard to snap a pictures. It wasn’t planned she had no idea that was where her and her daughter was sitting it was all God. Just another neat example of how God works. As the event was winding down and we were singing a few worship songs to close things out. These girls came down to the front and I’m still not sure what they had on the front of their shirt but I think it said we love you Beth and she came down off the stage and sang with them and prayed with them. Another one of those great moments to take in. 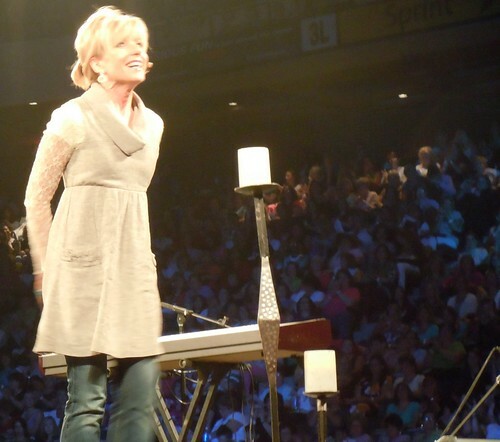 This is why I love and respect her ministry. 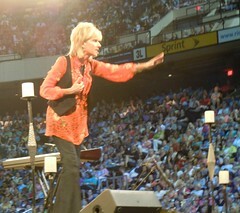 You can truly see her heart and her love to see women touched by God’s love. I had such a wonderful time. I have so many notes to go over and when I feel like I can truly go into those with you I will attempt to blog about that. God really did a number on my heart this week and I can see that He has me on a new path. New doors have opened and I can see other ones starting to close. Time to get in my prayer closet this week and dig into my word. Here are a few closing pictures of us volunteers. 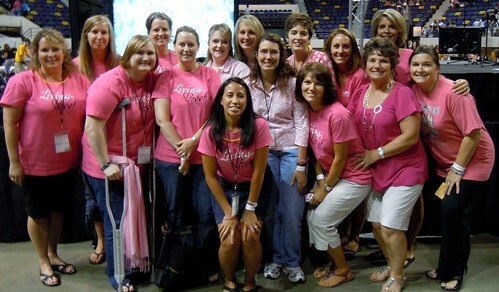 Thanks ladies for allowing me to participate with you and for taking such great care of my hips during the conference. Cannot tell you how much I enjoyed that post….So loved it….Loved reading your blog…Have a great holiday weekend.I have a GREAT HOLIDAY ORNAMENT GIVEAWAY on my blog…drawing on Mon.